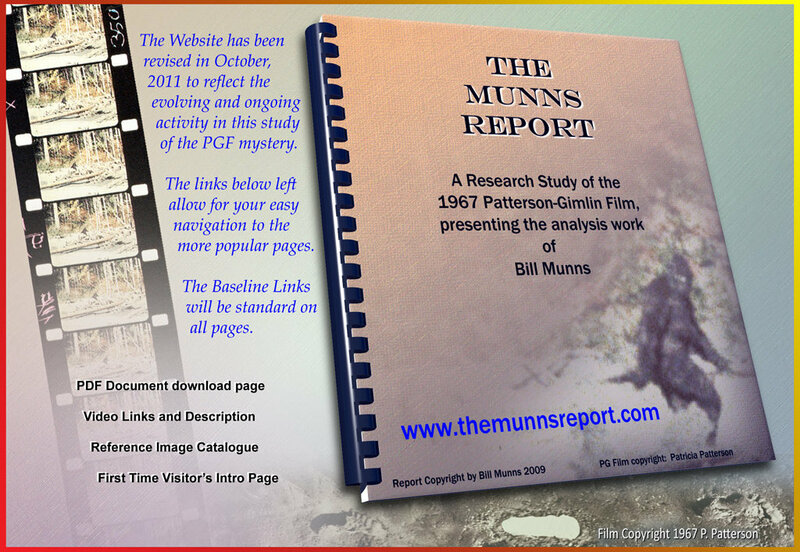 "The Munns Report" is an analysis by Bill Munns of the 1967 Patterson-Gimlin Film which was filmed at Bluff Creek, California and shows a strange fur-covered humanistic subject walking away from the camera as Roger Patterson chased it and filmed it. This website, owned and managed by Bill Munns, opened on May 15, 2009 with material explaining the effort to try and analyze the film, and specific elements within the film. The research and analysis effort has continued and expanded in scope, and this website structure has evolved accordingly. This re-organization of this website is the most substantial revision to date. The primary consideration was to re-organize the way my work has been structured, relying now extensively on PDF document releases, expanding to some videos to present some things in a more dynamic visual way, and provide large format reference images for others who have interest in this research. If you are new to this website, START HERE. If you are a returning visitor, you may go to the specific page content of interest from links on the home page image above. If you are a beginner to the whole subject of the Patterson-Gimlin Film, you can go directly to the "Beginner's Guide", HERE (3.1). I currently participate in discussions on the Bigfoot Forums as an active member and if you wish to engage in discussions directly with me, I invite you to join that forum and post comments there. I use the screen name "Bill" in that forum. Discussions of my report are found in this forum section: "Munns Report thread"
Issues with the JREF Discussion Forum - For two years or so, I participated as well in discussions on the JREF "skeptical forum" (using my full name of "Bill Munns" as my screen name) but I no longer participate in discussions on this internet forum, and the linked PDF Document explains why.